Raise your hand if you loooove rice! I know I do! I’d happily eat rice one way or another 5 days a week. 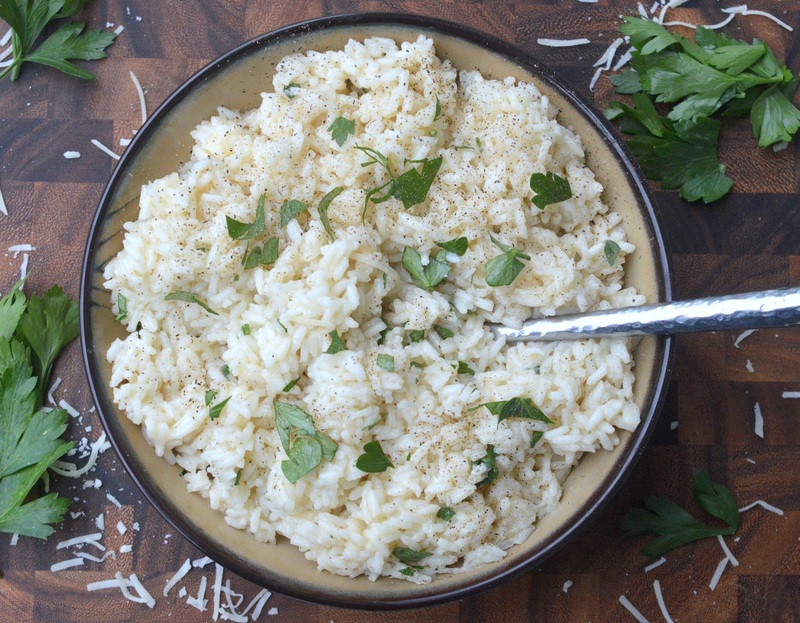 This Easy Garlic Parmesan Rice Recipe is sure to excite your taste buds. It’s flavorful, easy to make and everyone (kids too) seems to love it! 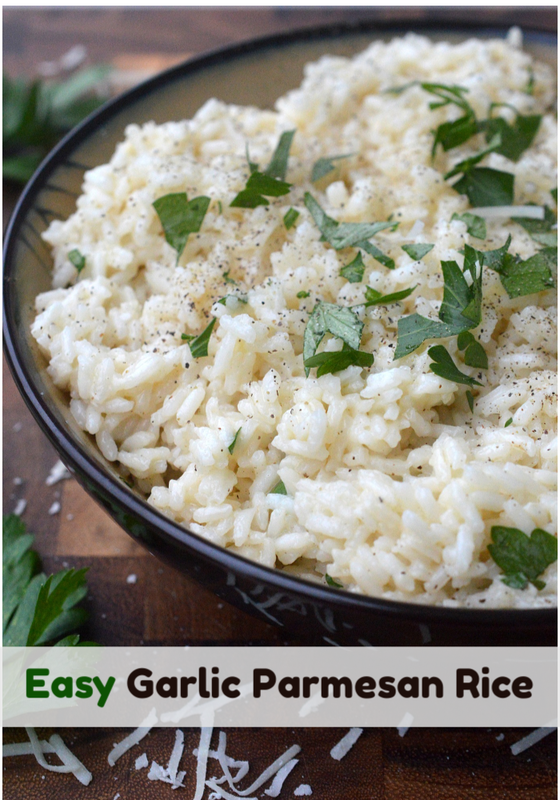 Making this Easy Garlic Parmesan Rice recipes is easy, all it takes is one pot and a handful of ingredients and you have yourself a nice side dish, a meatless meal or the start of something else. You can toss in some steamed and seasoned broccoli florets or pea pods or chopped zucchini that’s been seasoned and sauteed. Yum! 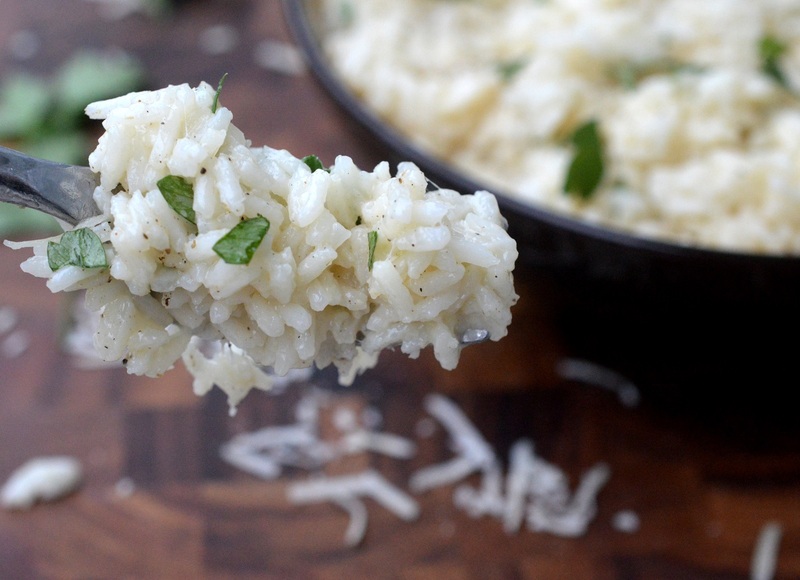 Below is the simple Easy Garlic Parmesan Rice recipe. You can decide if you want more cheese, more herbs, more garlic or if you want to add veggies. Choose to add some heat by way of red pepper flakes, cayenne pepper or chopped jalapeno. You can totally leave out the garlic as well if that’s not your thing…It’s still delish! You can really take this recipe anywhere you want and make it your own. I use chicken stock, but the vegetable stock is an option as well, especially if you wish to keep this vegetarian. Splurge on some good Parmesan for this (and definitely cut your self of a chunk or two to nibble on). Shredding it yourself makes this rice sing with flavor. Tag me on Instagram or Facebook with a pic or your creation if you make it! I love seeing those! Read the note section of this recipe prior to making the recipe. Use a medium-sized pot to prepare your rice. Combine, rice, butter water, 2 cups of chicken broth (or veggie stock) and cook over medium heat until done. Add in garlic paste, Parmesan cheese, salt, pepper and stir just until cheese melts. Add in remaining chicken broth and parsley. Season with additional salt and pepper. Stir, taste and adjust for seasoning.then scatter additional parsley overtop and serve. *Note - Rice brands will vary use so cook times for this will vary. However, you know when the liquid had just about all been absorbed by the rice...your rice is done. Take a quick taste to verify. If not, add in a little more liquid until it is done to your liking. Whatever amount of liquid is called for to cook your brand of rice change that to half water and half chicken or vegetable stock.